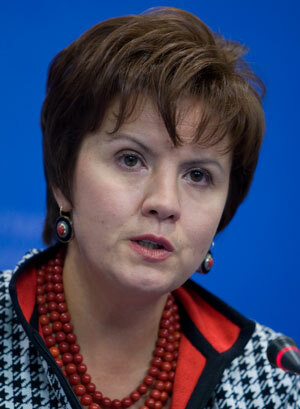 The Ukrainian parliament re­gis­tered the bill “On Principles of the State Language Policy” at the end of last August. The law was drawn up by the Party of Regions MPs Serhii Kivalov and Vadym Kolesnichenko. It will be recalled that, under the draft law, Russian would be a regional language in 13 out of Ukraine’s 27 oblasts. The European Commission for Democracy through Law (Venice Commission) has announced after examining the bill that it does not have enough guarantees for the usage and protection of the Ukrainian language. Although the draft law no longer focuses on the Russian language, it ensures that the latter has the same status as does Ukrainian. Meanwhile, Serhii Kivalov’s press service has already announced that this bill was approved by the Venice Commission. The Day requested Maryna STAVNIICHUK, member of the European Commission for Democracy through Law, to comment on the commission’s conclusions about the draft law and on the Ukraine-EU summit. “The conclusions and recommendations of the Venice Commission (VC) about the draft law on principles of the state language policy, prepared by Kivalov and Kolesnichenko, are not unequivocal indeed. Naturally, the VC marked certain progress in comparison with the draft law it had examined and reported on in March. At the same time, the commission said clearly that the foundations of the state language policy should recognize an unconditional priority of the integrative role of Ukrainian as a single official language in compliance with the current Constitution of Ukraine. The Venice Commission says the languages of ethnic minorities must receive certain guarantees for being used in all the spheres of society. On the other hand, it notes that there should be not only mechanisms for putting this into practice but also guarantees for bringing into play legal mechanisms for these languages. In my opinion, the Venice Commission arrived at a well-ba­lanced conclusion because it notes progress and development in Ukraine’s language policy. But, on the other hand, the VC clearly outlined some warnings about the language question, an extremely delicate issue for any state. Moreover, the VC always reiterates the general principle used by all countries without an exception: granting the right to use regional and minority languages should not hinder the official language. And what recommendations did the Venice Commission give about this draft law? And what do you think of the recent Ukraine-EU summit?